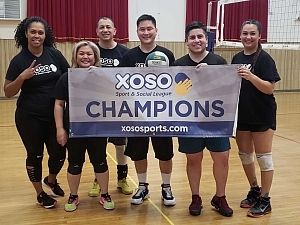 The "Black Panthers" are our Sunday volleyball champions, taking down "Team Best Friends" in a competitive 2 sets to 1 victory. The teams traded 21-19 wins, building toward what we thought would be a great 3rd and final set. Instead the "Black Panthers" were the ones who kicked it to another gear, dealing quite the knockout blow with a 21-11 win to seal the championship victory! All season the "Black Panthers" had their eyes toward the podium. Thanks to the successful regular season they entered the playoffs as the #2 seed, setting them up with a match up against "House of Pancake" for a spot in the championship. Despite a great effort, "House of Pancake" couldn't overcome being undermanned. In the end the "Black Panthers" won in straight sets. Overall our champs finish with an 8-2 record to cap off their title-winning season. That includes a string of 5 straight wins to close things out. The cherry on top was defeating "Team Best Friend" in the final, a team who our champs had lost to in the first game of the season. In all an incredible season for the "Black Panthers"! Now we look forward to seeing if they can defend their title!